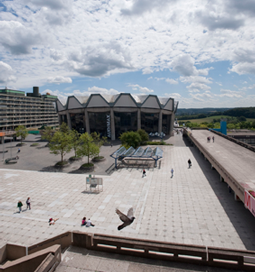 Located in the midst of the dynamic, hospitable metropolitan area of the Ruhr, in the heart of Europe, the Ruhr-Universität with its 20 faculties is home to 5,000 employees and over 33,000 students from 130 countries. All the great scientific disciplines are united on one compact campus. 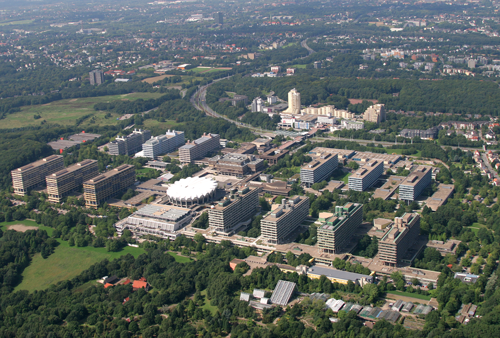 The Ruhr-Universität is on its way to becoming one of the leading European universities of the 21st Century. Almost all courses are offered as Bachelor and Master degrees that enable “learning through research”. Our excellence programmes have made themselves an international name: our Research School is an ultra-modern international college for structured doctoral research in the life sciences, natural sciences, engineering, the humanities and social sciences. Interfaculty and interdisciplinary Research Departments, which are mutually and internationally networked, sharpen the profile of the RUB. Added to this is an unsurpassed programme for the promotion of young scientists, and an excellent infrastructure. d, sharpen the profile of the RUB. Added to this is an unsurpassed programme for the promotion of young scientists, and an excellent infrastructure. And what makes it all comes alive is the people who meet on the campus with their thirst for knowledge, their curiosity and their commitment, and who help shape the Ruhr-Universität. Their open-mindedness makes the RUB an attractive place for people from around the world. As a strong part of the society, the RUB is not only firmly rooted in the region, but also acknowledges its social responsibility in many ways. Internationalism traditionally has a very high priority at the Ruhr-Universität. The university cooperates in research and teaching through many active partnerships with universities and research institutes around the world. Members of all departments are involved in international research networks and maintain intensive international exchange. university neighbours, is running liaison offices in New York and Moskau.